The Philadelphia-based, 60s-rock-inspired Dr. Dog have been garnering attention since the left-field success of their 2005 LP, Easy Beat, and most recently released their fifth LP, Fate. They came to town last summer to play a well-received set at Lollapalooza. Lead by singer-songwriter Jesse Elliot, D.C.-based These United States specialize in an eclectic sound marked by elements of alt-country, garage rock and folk. They released their sophomore album, Crimes, late last year. As the son of Cheap Trick guitarist Rick Nielsen, Rockford-born singer-songwriter Miles Nielsen is versed in Midwestern rock and roll, as proved by his debut album, Miles. Nielsen describes his music as "Beatles-eque Cosmic Americana," complete with "pop rock arrangements and sunny melodies tucked between a long lost country folk steel guitar floating through speakers around crashing drums, bouncing bass lines and smooth as butter keys." Unexpectedly surfacing earlier this year, Tinted Windows is an unlikely "supergroup" consisting of James Iha of the Smashing Pumpkins, Bun E. Carlos of Cheap Trick, Adam Schlesinger of Fountains of Wayne and Taylor Hanson, the middle Hanson brother. The band's style is straightforward, singalong power pop driven by each member's trademark, from Hanson's bubblegum vocals to Carlos's power drumming. The group released their debut, self-titled album in April (reviewed here). While their biggest recognition might have come when their cover of Neil Diamond's "Girl, You'll be a Woman Soon" was used in "Pulp Fiction," local act Urge Overkill were notable members of the alternative rock scene from its very beginnings. Formed in 1986, the band developed a solid fan base with releases such as Americruiser and The SuperSonic Storybook, touring with Nirvana and Pearl Jam and consistently releasing music through the mid-90s. The band split in 1997, but have since reformed and are preparing a new album for release. Seattle's Posies emerged in the late-1980s and became one of the most prominent power pop acts of the 90s, updating the classic sound with the decade's alternative rock style. At the Taste of Randolph they'll perform Frosting the Beater, their 1993 LP that spawned the singles "Dream All Day" and "Solar Sister." 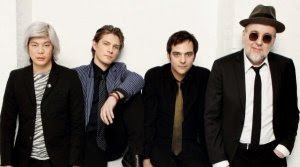 In 2006, this Britpop-influenced Chicago band was selected as one of the "Top 25 Bands on MySpace" by Rolling Stone, and have since released an EP titled Bad Blood. They're currently working on their debut full-length. This eclectic, hook-heavy pop/rock duo from LA will head to town for a slot at Taste of Randolph in addition to a handful of additional local gigs this month. Brooklyn's ever-touring, always energetic storytelling rockers will return to Chicago for a headlining slot at the fest. The band recently released A Positive Rage, a CD/DVD set that includes a live show recorded in 2007 at Metro. Featuring members of past Chicago power pop mainstays such as Material Issue and Box-O-Car, this four-piece combines the sounds of their past with a new wave sheen for infectious results. They recently released their debut, self-titled album. This recently-formed local act includes past members of indie pop favorites Office.